New paper out of possible interest to those studying the microbiology of the built environment: Frontiers | Beneficial effects of plant-associated microbes on indoor microbiomes and human health? | Frontiers in Plant-Microbe Interaction. 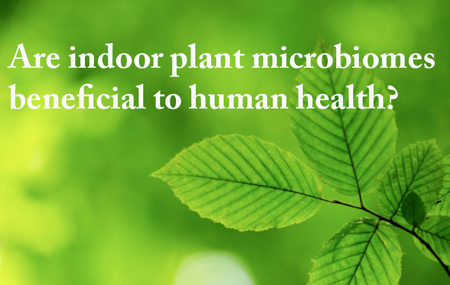 The paper makes some arguments regarding possible connections between indoor plant microbiomes and human health. I am posting this here without commentary in the hopes that others will look the paper over and make some comments. Any opinions out there on this? Will depend strongly on the growing medium, watering schedule and amounts, humidity and light in the environment, and ventilation of the indoor environment. indoor plants have not been shown in scientific experiments to effectively clean indoor air. The most famous study – done at NASA by Wolverton – was in a static chamber. Even if the removal rates reported there were applied to a house by filling the house with three vertical layers of plants with the pollutant removal rate reported by Wolverton would be equal to 0.1 air changes per hour,the air change rate (by leakage) of an extremely tightly-sealed house – better than most modern, energy efficient houses. Did you see the new paper Hal? See http://microbe.net/2015/08/29/effect-of-a-houseplant-on-its-environment/. What do you think?